In a previous post, I mentioned that I’d been given some lovely material when I went to the Stitch Gathering in Edinburgh last year. 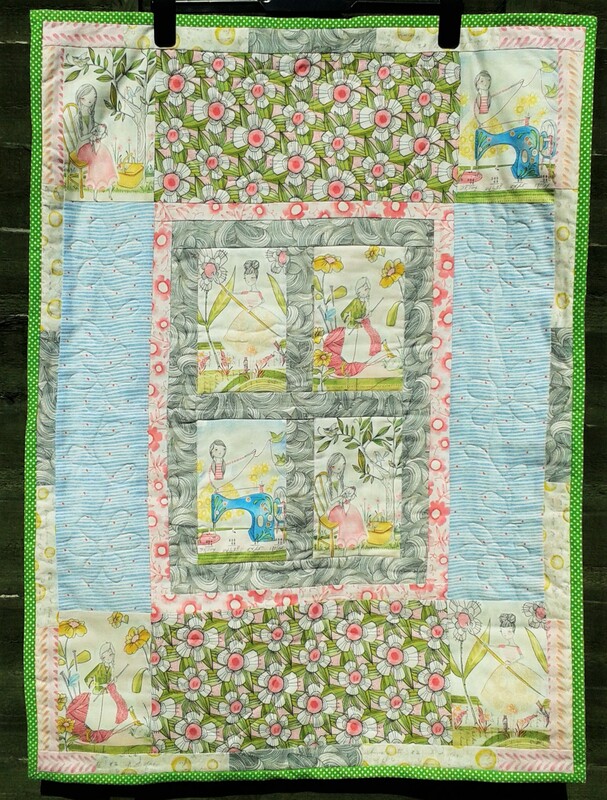 I used this fabric (from Cori Dantini’s The Makers collection) to make a quilt for a friend’s new little arrival, Lily. Unfortunately, I ran out of fabric before I could finish the quilt and was a bit stumped as I couldn’t seem to find much online. Happily this problem was resolved during a recent trip to The Fabric Guild where I discovered several fat quarters in the same collection so I could finally crack on with finishing it. 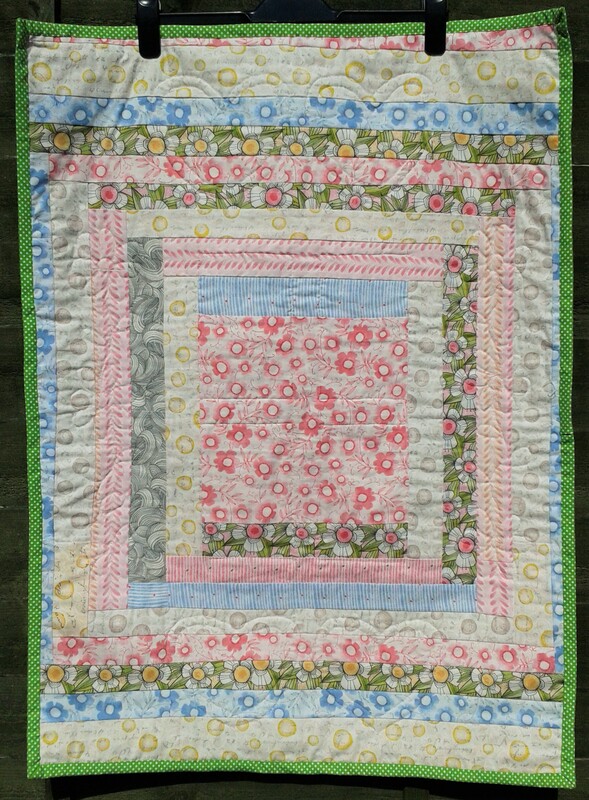 I was quite relieved as I was a bit worried that Lily might have grown up before I could present her with the finished quilt! As I only had fat quarters, I decided to sew them all together in a courthouse steps design so that I could create a backing ‘fabric’ for the quilt. It was a little bit improvised and I just carried on adding strips to the main square but I do think that it looks quite good. I did a little bit of free-motion quilting on each side in a flower design (about the only design that I can successfully complete at the moment). I know that the recommended stitch-length for free-motion sewing is about 1/8 of an inch. Sometimes I achieved this…sometimes I didn’t…but I don’t think it looks too awful overall! 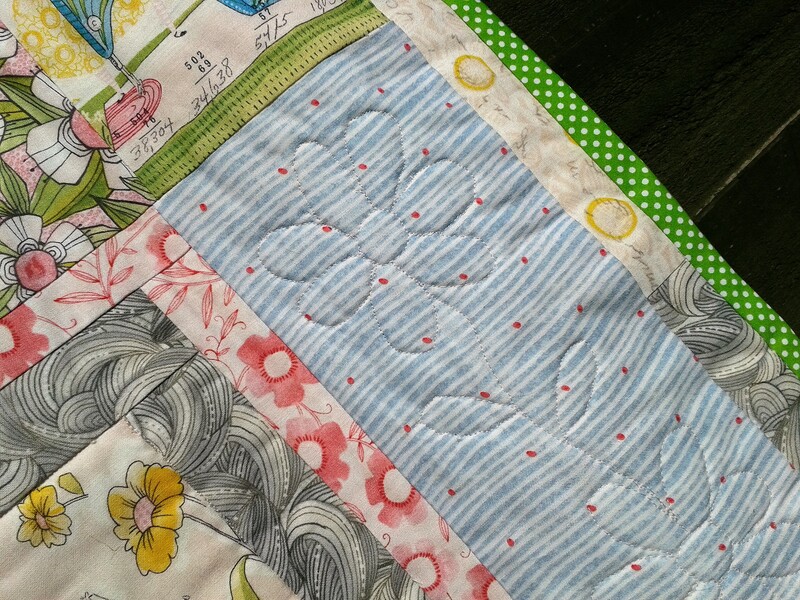 I also sewed a few hearts at the top and bottom of the design and added a bit of ‘stitch-in-the-ditch’ quilting just to join the middle section to the backing fabric. I took my quilt top to a nearby sewing emporium to ‘audition’ binding for the quilt as I wasn’t quite certain what would work as a border. I hadn’t expected to choose green but I think it works wonderfully and really brings the colours together. I finally bought the binding from Higgs and Higgs, who have a brilliant selection. Definitely a good find for future makes. Don’t just start trying to make a quilt-top because you’ve got some really pretty fabric and you really, really wan’t to use it. Have a plan! Had I planned this, I might not have taken quite as long to complete it! I kind of made it up as I went along. Happily, the finished result isn’t too awful..
Use fabric basting spray to bind your quilt layers together. It’s a revelation. No pinning and you can re-position your fabric as many times as you like! Spend time looking at different types and colours of binding. I was just going to order some pink binding but I’m so pleased that I had a bit of time to consider different colours. I really do feel that I am developing my skills in this craft and I am also particularly proud of my mitred corners! I do hope that Lily will like it! Well, I hope that you are enjoying this sunny afternoon wherever you are. Look out for my next post, which will undoubtedly feature my annual visit to the Festival of Quilts. Only a week to go!! !